Founded in 1970, the Association of Puerto Ricans on the March (APM) has grown into a multifaceted organization that provides a broad range of services, including job readiness and drug-and-alcohol rehabilitation. Through a network of clinics and community centers, APM assists an annual clientele of 2,500 people in eastern North Philadelphia. In addition, with a 200-person staff, APM is the neighborhood's largest employer. In 1993, APM decided to stabilize the community through a strategic process. By assembling large parcels of land for new rental developments, this nonprofit corporation hoped that affordable housing would encourage people to stay in the neighborhood. The already established base of social services would prove to be essential for generating an economically stable population that could support redevelopment of the physical community. APM's housing program has received considerable acclaim. This tour stop includes four sites developed by APM during the 1990s, after the organization adopted a strategic plan for neighborhood revitalization. APM proposed real-estate ventures that would improve the community by creating a critical mass of development and by establishing a link between housing and support services. Because the largest vacant sites could be found on or near Germantown Avenue, this two-lane-wide street became the focus of APM's development activities. 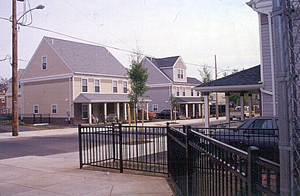 Jardines de Borinquen (6th and Diamond Streets), a 90-unit rental venture, is strategically located across from an elementary school. Archways and tiled roofs give this low-rise residential complex a distinctive Latin flavor. The design includes front entrances to provide a strong presence on the street, while an inner courtyard provides a secure play area, rear yards, and parking. 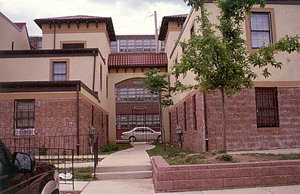 Further up the avenue is Hogar de Esperanza (2203 Germantown Avenue, at Dauphin Street), a midrise apartment building with 20 units of rental housing for people with AIDS and their families. The building also includes a Head Start childcare facility. Adjacent to Hogar de Esperanza is Taino Gardens (6th and Dauphin Streets), a 42-unit development with two- , three-, and four-bedroom rental townhouses. In keeping with the city's policy of supporting new housing construction at lower density, the townhouses are semidetached (twins) with generous yards and room for parked cars. Having brought more than 200 units of new housing into the community in less than a decade, APM was able to convince investors that neighborhood population had sufficiently stabilized and expanded to support development of a new supermarket. With assistance from the Redevelopment Authority of the City of Philadelphia, APM assembled 111 small parcels of vacant land into a 3.5-acre sitelarge enough to accommodate a retail center with a 40,000-square-foot supermarket and associated parking and loading areas. One block of Germantown Avenue was closed off and integrated into the development site. APM secured $5 million in financing from a number of public, private, and charitable sources. 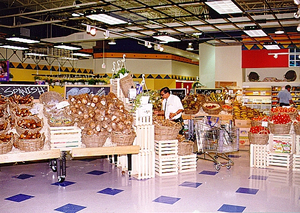 Brown's Thriftway (later Cousins Supermarket), the initial stage of the Borinquen Plaza retail center, opened in 1999. The first supermarket in the area in more than 30 years (and replete with Latino speciality foods), it created 75 new jobs for community residents. APM has worked closely with Philadelphia Green, a program of the Pennsylvania Horticultural Society, demonstrating how "greening" can be used as a tool for neighborhood revitalization. In the book Neighborhood Recovery, John Kromer describes development activities of the Association of Puerto Ricans on the March (Chapter 2, "Advancing the Plan") and the value of homeownership to Latinos and other minorities (Chapter 4, "The New Homeownership"). APM is discussed in 21st-Century Neighborhoods: Assets & Advantages of the Older American City, a 38-page illustrated booklet available from the Community Design Collaborative ($8).